AFI makes substantial delivery fleet investment with Scania. One of the UK’s leading powered access specialists AFI Group has expanded their in-house transport delivery fleet by announcing a £1m investment in premium brand Scania. Over recent years AFI have invested heavily in a rolling programme to provide their own in-house transport fleet so that they can take full responsibility and control of every aspect of the delivery process for their powered access fleet. They have increased the efficiency of the fleet by strategically locating the vehicles throughout our UK depot network to ensure that the Mobile Elevating Work Platforms (MEWPs) are delivered to customers quickly and collected promptly. 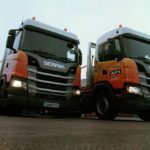 AFI have ordered nine Scania G-series, 26-ton rigid vehicles (G320). The new G-series provides excellent comfort and visibility with a world class driver’s area, with generous space and storage. All vehicles come with Scania’s standard two-year repair and maintenance programmes.